There are a lot of different reasons why people think children should learn hot to do handwork, like knitting or crocheting. Some believe that handwork teaches children to be more creative, others believe it has a positive effect on the development of cognitive thinking, and some people just think it is cool to teach kids how to do these things. Whether you believe all of these different reasons for teaching kids how to knit or crotchet, or even just believe some of them, a lot of children do enjoy working on handwork projects. Honestly, there is nothing quite like learning how to do something, working on it, and then enjoying the fruits of your labor. Have you ever allowed a child to help you bake a cake, then listened as that child proudly told everyone about helping to bake it? The same thing will happen after a kid finishes a crotched scarf, knitted hat, or knitted stocking. Put your thumb and pointer finger through loop. 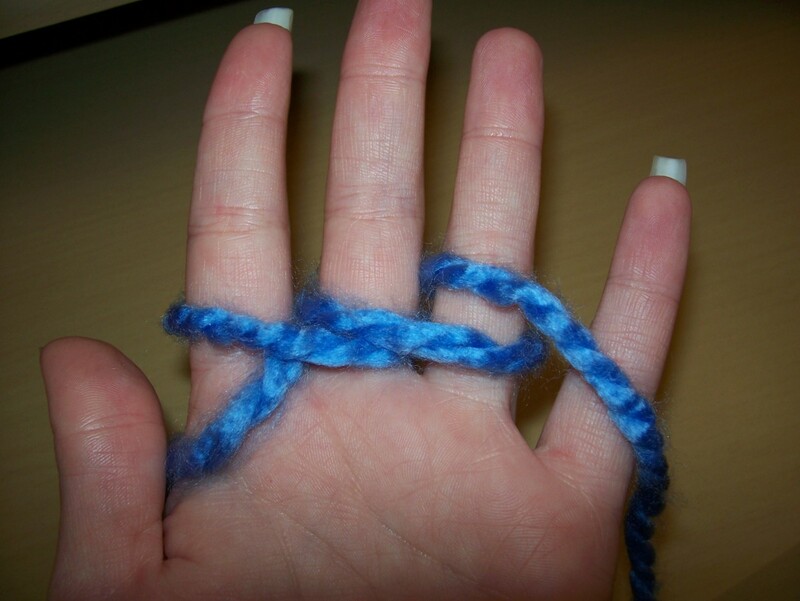 Use fingers to pull yarn through loop. Make your chain as long as you want. 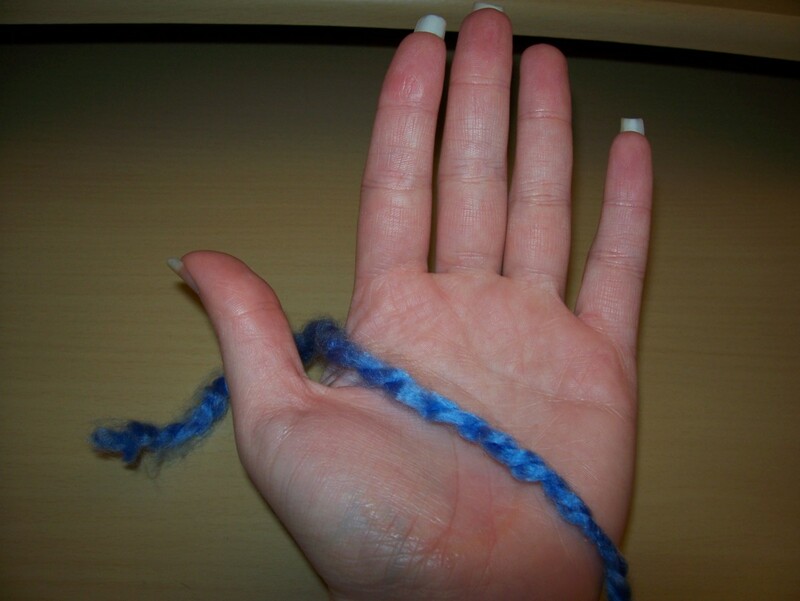 Palm facing you, yarn between thumb and pointer finger, tail behind hand. 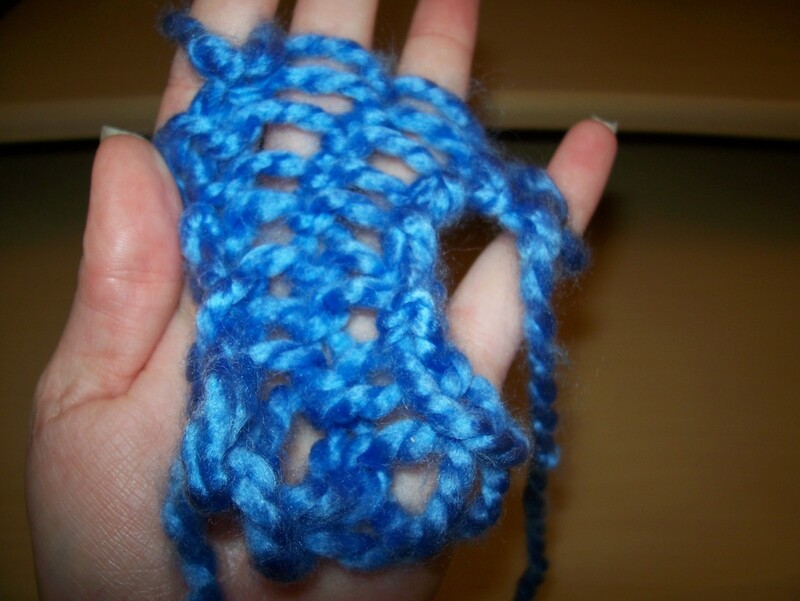 Wrap yarn in front of pointer finger,then back and all the way around finger. Wrap yarn back and around middle finger. Wrap yarn back and around ring finger. Wrap yarn back and around little finger. Wrap yarn around back of little finger, letting it hang over palm. 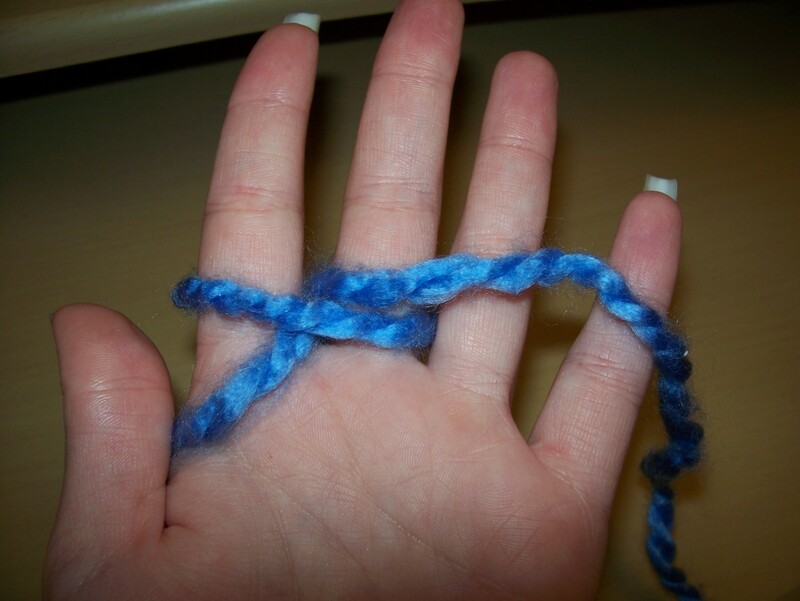 After pulling the old strand of yarn over from the back of your little finger, wrap the yarn back behind your ring finger. See the "old" strand behind your finger? This is the one that is pulled over the "new" strand and off of your finger. The stitches you are creating. The other side of the stitches. What the back of your hand looks like as you finger knit. No matter why you want to teach kids how to knit or crochet, you need to know how to do it before you can teach it. Once you are adept at doing these crafts yourself, you will be able to teach others how to do it. 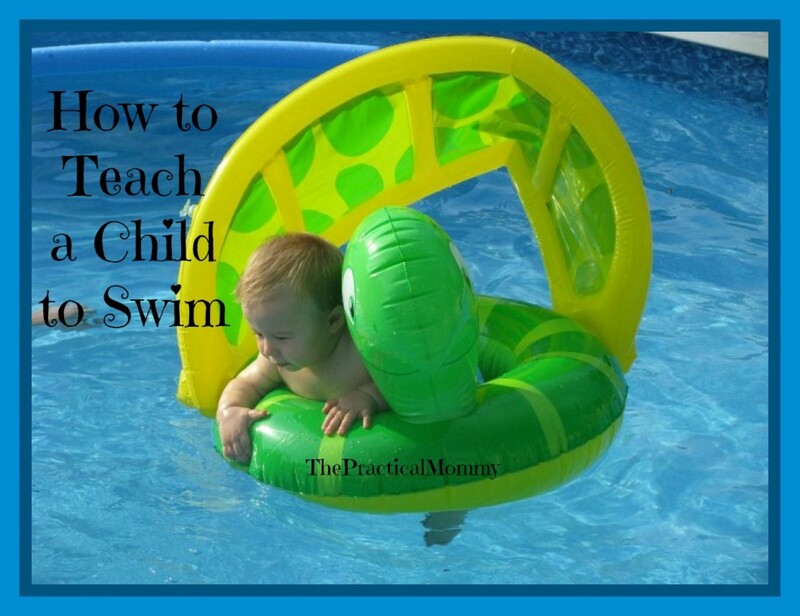 Whether you are just beginning or have been doing handwork for years, these tips will probably help you teach children how to do it. 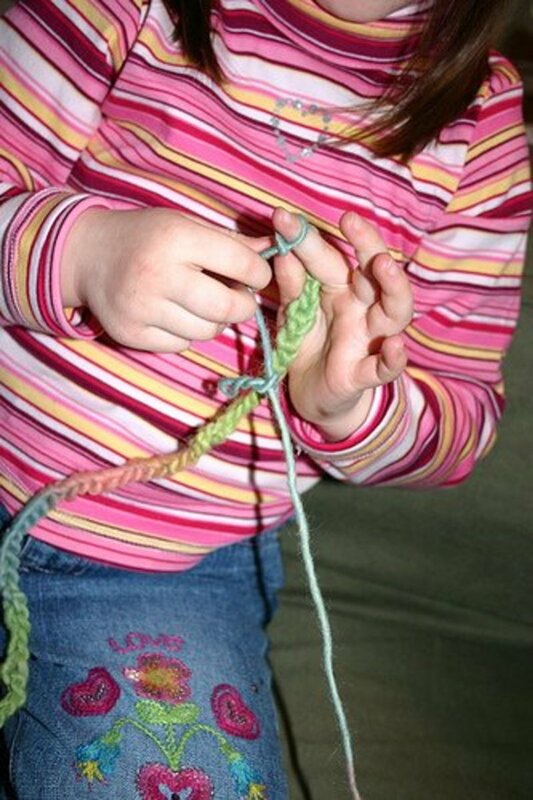 Before you actually start teaching kids how to knit or crochet with needles, I suggest that you start them off with learning how to finger knit. Once they understand the concept of how stitches are woven together by doing it with their fingers, it will be a lot easier for them to do it using hooks and needles. 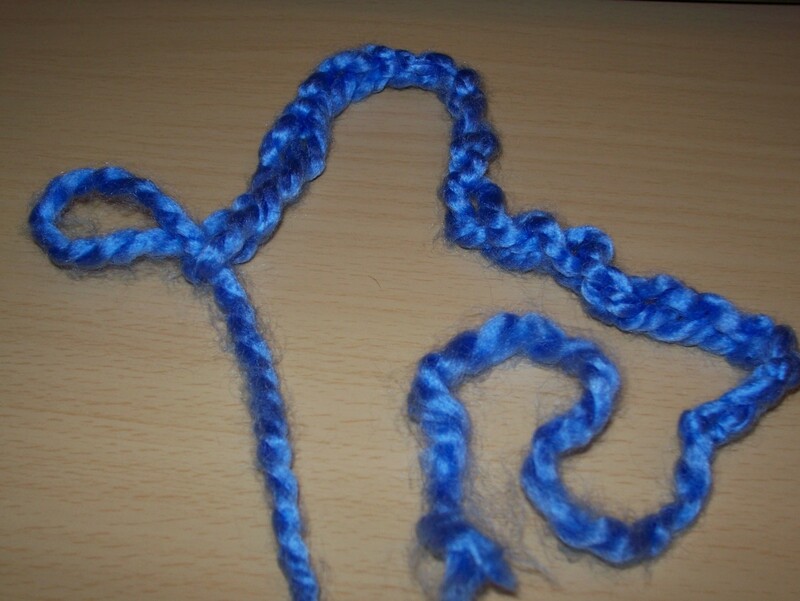 Finger knitting a chain is quite simple, and I bet you will find kids can make endless chains (they make nice Christmas tree decorations—wrap them around instead of garlands of popcorn). 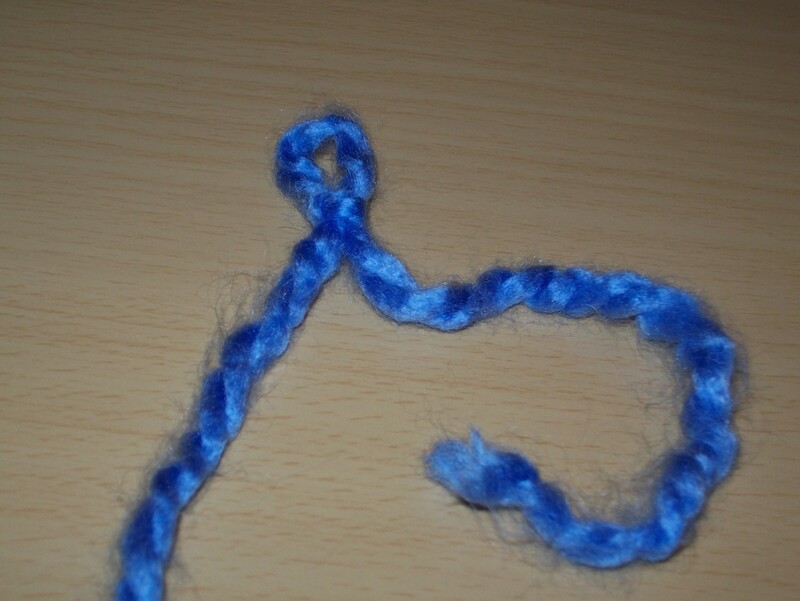 First, make a slip knot with your yarn, leaving a tail of about 5” or so. Make sure the loop is big enough for your thumb and pointer finger through. 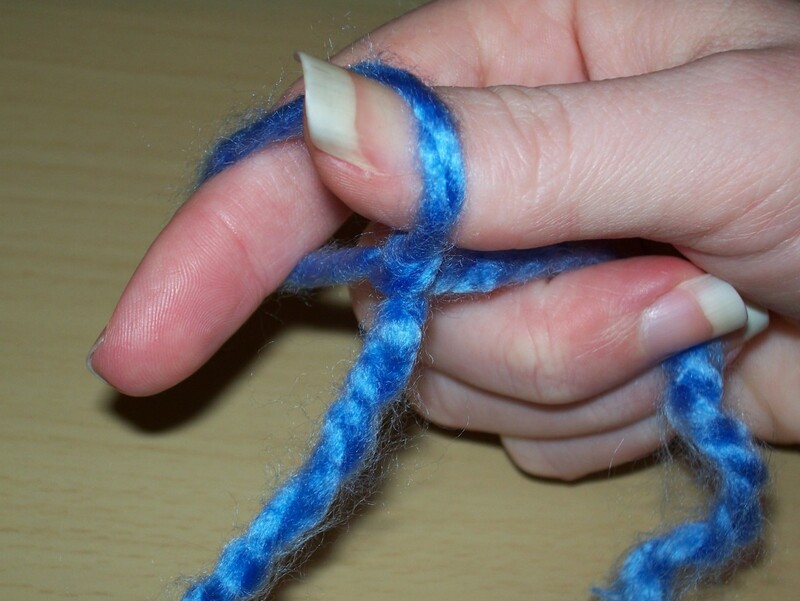 With the loop around these two fingers, pinch the loose yarn between them, and pull it through the loop. Draw the new loop through until the original loop is pulled snug. Continue making new loops, until the chain is as long as you want it. 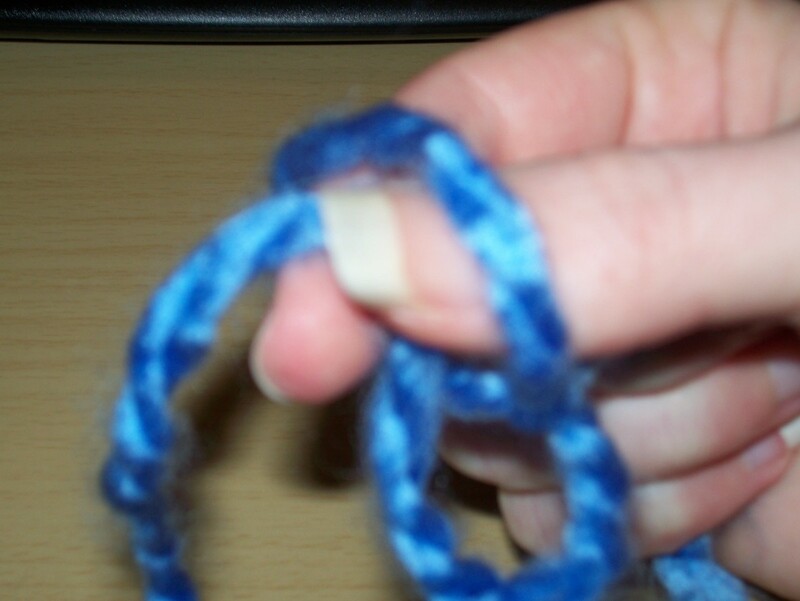 To end the chain, cut the yarn off of the ball, and then pull the loose yarn through the last hoop to make a knot. 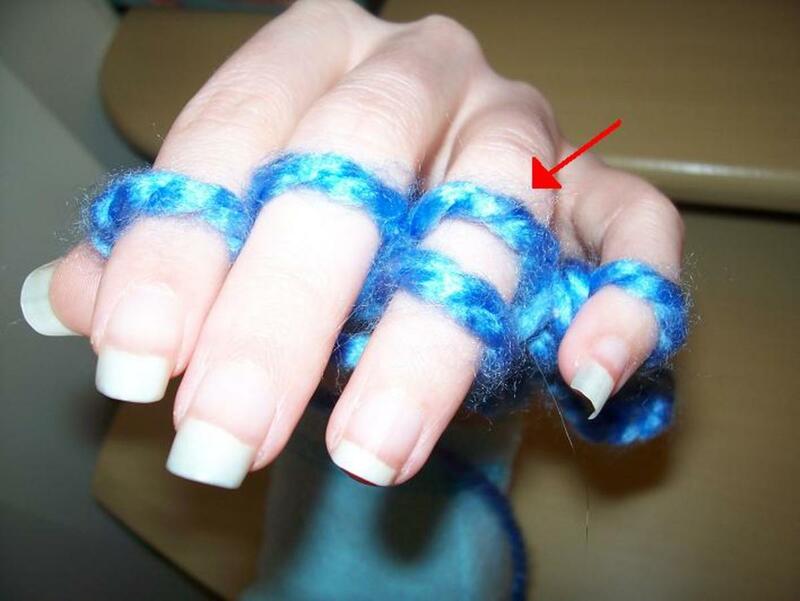 You will begin this knitting by wrapping yarn around the fingers of one of your hands. 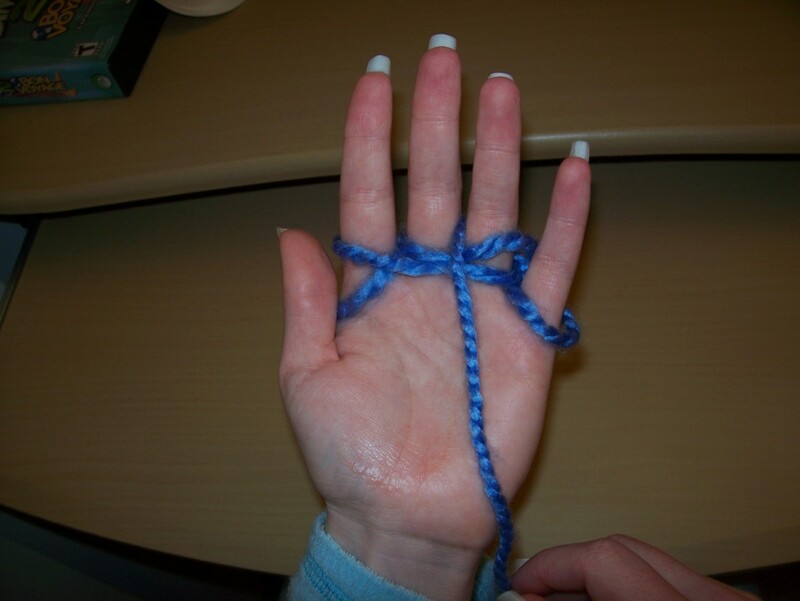 If you are right-handed, you will want to wrap the yarn around your left fingers; and, if you are left-handed, you will wrap them around your right fingers. Turn your hand over so your palm is facing you. 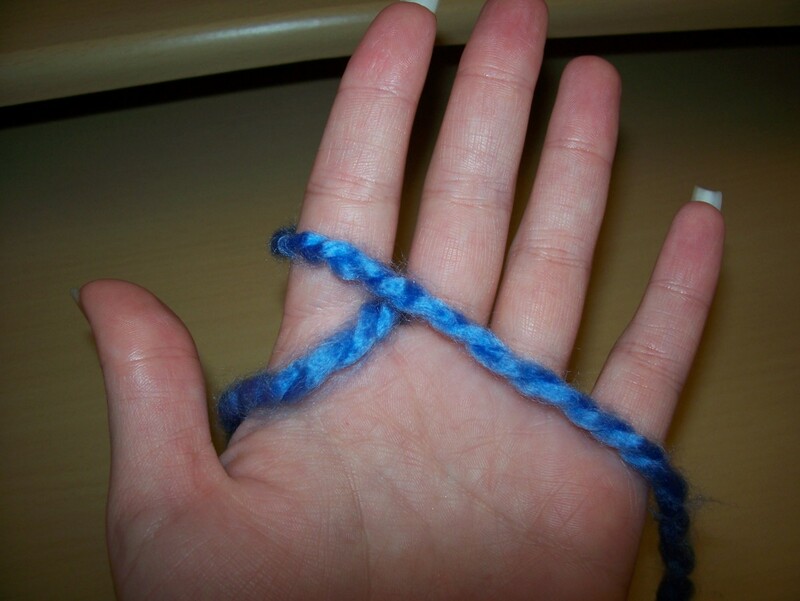 Drop the yarn between your thumb and pointer finger, leaving the tail hanging behind your hand. 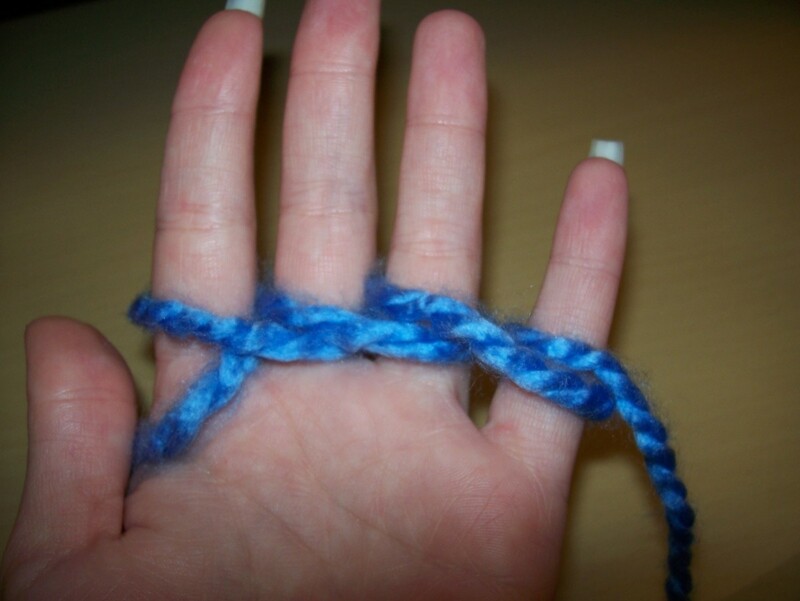 Wrap the yarn in front of your pointer finger, then all the way around the finger, so the yarn is ends up in your palm again. Now, wrap the yarn all the way around your middle finger. Continue doing this with all four fingers, but don’t wrap them too tightly (it is harder to work with and you might cut off your circulation). After casting on, the yarn will be hanging from your little finger. Wrap it around the back of your little finger, letting it hang over your palm between the little finger and ring finger. Lift the old strand of yarn from the back of your little finger, pulling it over the new strand, and then off of the end of your finger. 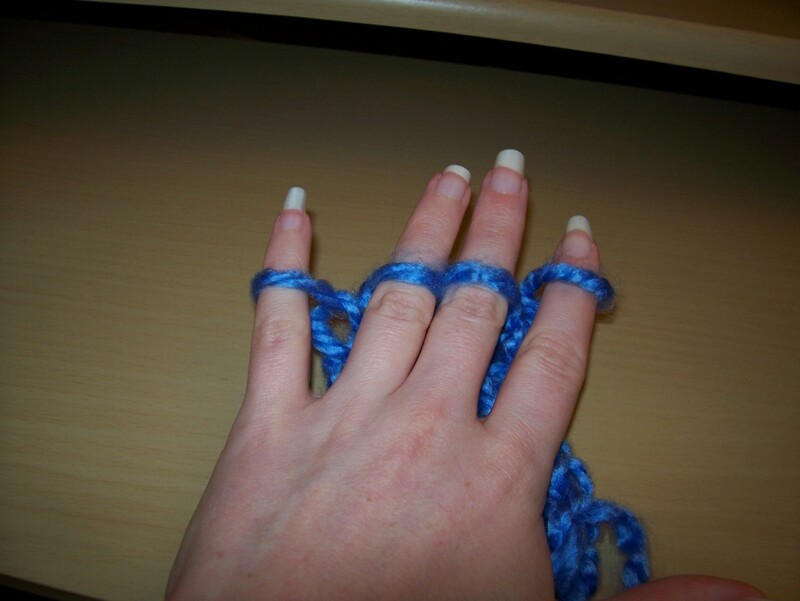 Now, wrap the yarn behind your ring finger, letting it hang over you’re your palm, between your ring and middle fingers. 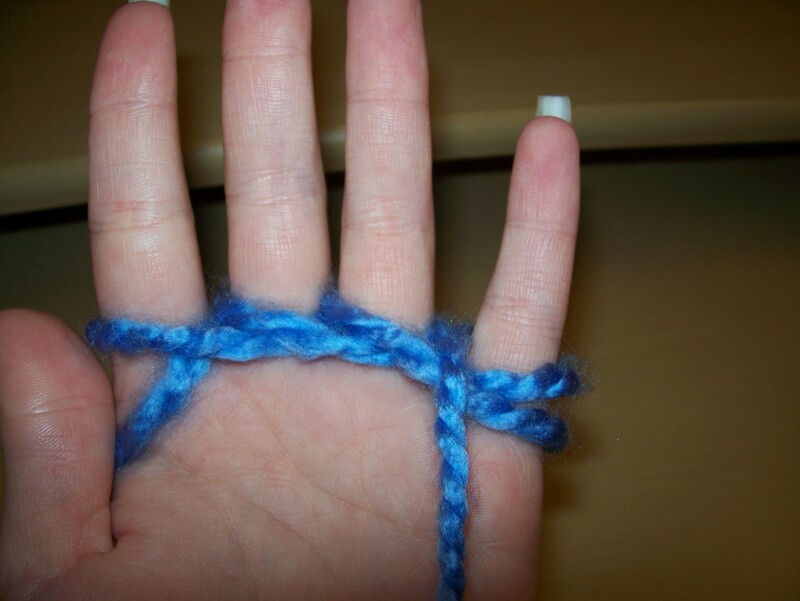 Lift the old strand of yarn on your ring finger, and pull it over the new strand. Let it slip off of your finger. Repeat this for the rest of the fingers on your hand. –Once you have completed this, you have finished finger knitting your first row. 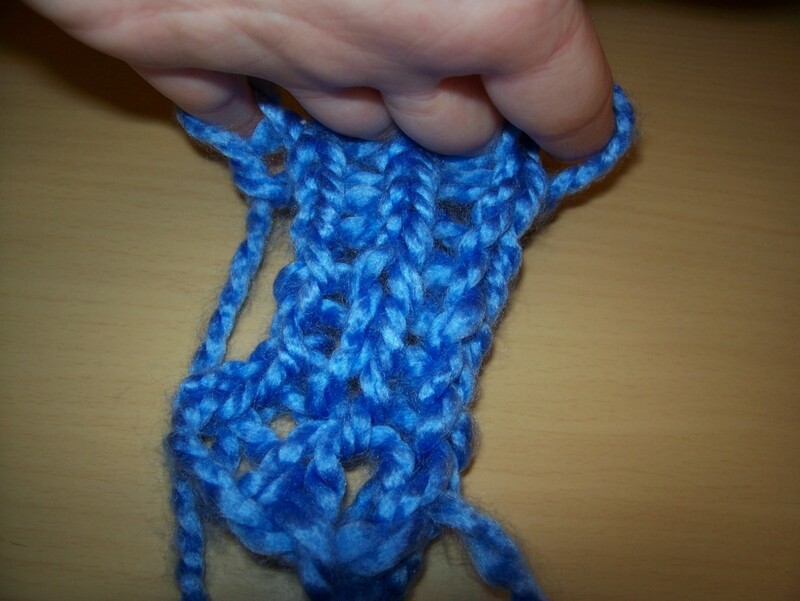 To knit the second row, work across your hand starting from the pointer finger, and ending with your little finger. You will wrap the yarn behind each finger, lifting the old strand over the new strand, then pulling it off of your finger. Continue working these rows, back and forth, until your piece is as long as you want it. To end (or bind off), cut the yarn loose from the ball. 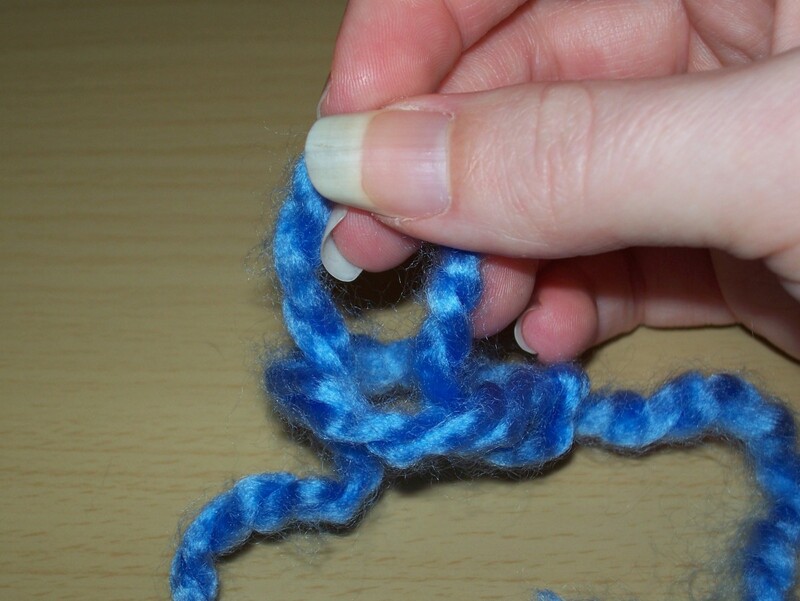 Pull the piece of loose yarn through all four of the stitches, securing a knot. 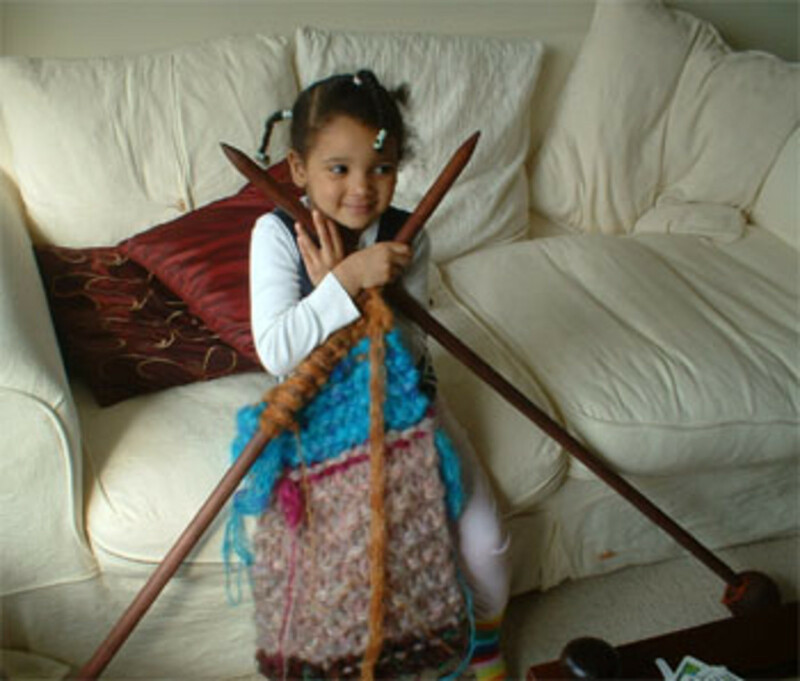 Bigger hooks and yarn help children learn how to crochet. Okay, these knitting needles are a bit much, but I have seen them used in classrooms as a demonstration. I've seen kids knit things like this. I knew a fourth grade class who knit an entire farm, and then auctioned it off at the annual school auction. It was amazing. Once the children are comfortable finger knitting, it is time to move on to other kinds of handwork. I recommend that you teach them how to knit, and then teach them how to crochet. Honestly, if you know how to knit or crochet, you can teach a child. But there are some things you can do to make it easier. Have the children use bigger needles and hooks. The bigger ones are easier to work with for beginners, especially kids. Use thick yarn. The yarn size needs to match the needle size. Kids aren’t going to knit small, intricate things at first, so go big. Make it fun. A lot of schools tell stories that go along with the knitting or crocheting. A school I worked at started off every lesson block with a story—it made what the children were learning more accessible. Use a rhyme to help the children remember the steps. One I’ve used while teaching children to knit is: “In through the front door, run around the back, peeking through the window, and off jumps Jack.” In through the front door = right knitting needle entering loop from the front. Run around the back = yarn wrapping over needle, from around the back. Peeking through the window = pulling needle back through loop (with new yarn over needle). And off jumps Jack = dropping old stitch off of left needle. If you know how to crochet or knit, all you need next is a bit of patience, and you will be doing lots of handwork projects with kids. 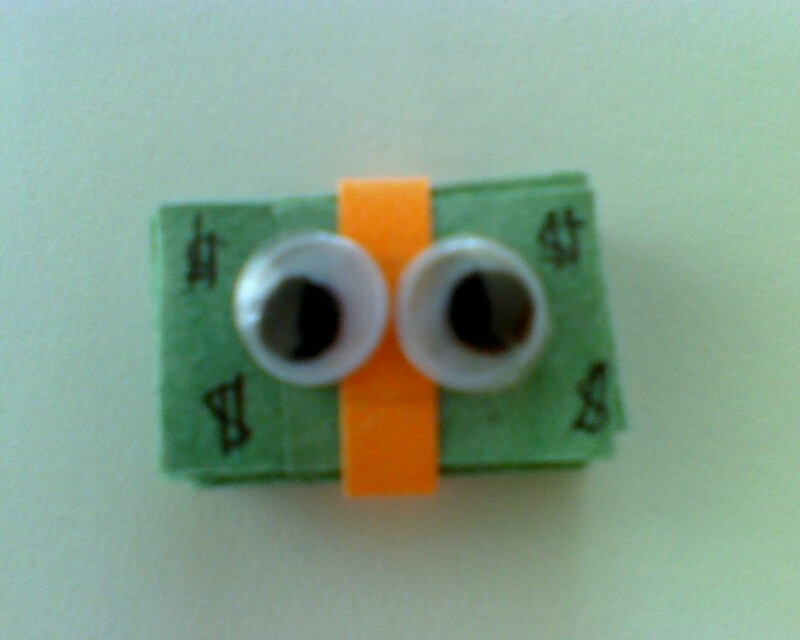 Whatever the kids make can be used for themselves, given as gifts, or even donated to charity. Thanks for the advice! I am teaching 2 kids how to crochet and 1 of them is left handed while i am right handed. Its kinda complicated and they have seen me make hats, blankets etc. So they start the chain and they start asking me : "Is this going to make a hat? Is it long enough? No! I don't wan't to do this! I wanna make a hat!" They are in 4rth grade. I need advice from anyone please. Hi, This is lovely. I've just knit a frnied's newborn a chunky moss stitch blanket from a Drops design using Polaris - lovely soft 100% wool also. But I love your bias knit, and the drifting colours, might have to hunt out some eskimo too! 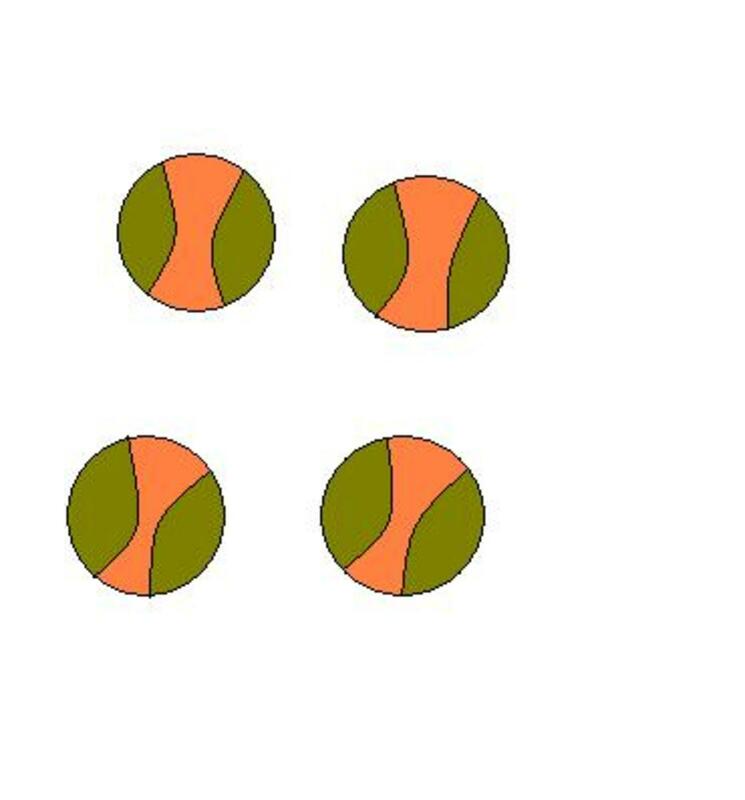 Ok, gaan we:toer 1: 1 steek opzettentoer 2: eetsre steek meerderentoer 3: eetsre steek meerderen, 1 steek rechtstoer 4: eetsre steek meerderen, overige steken rechtstoer 5, etc: herhaalAls je op de helft bent:toer x: eetsre 2 steken samenbreien, overige steken rechtstoer x, etc: herhaallaatste toer: 1 steek rechts, afhechten.Succes! My 8 year old granddaughter is a lefty. I'm right handed. Any suggestions to make teaching her easier???? Love the rhyme. The finger knitting is a great stop for us thanks for making it simple and giving exact steps. I want to learn how to knit, it all depends on time and who is going to teach me. you did a great job on this hub. Nice hub! I learned to crochet as a child and it has been wonderful ever since. Knitting I learned later and I can tell a difference between how well I do either. The yonger you learn, the better! Knitting a finger strip seems a little difficult for me, I must be stupid, but I am going to try it. Once I've mastered it, I'll see if my granddaughter enjoys doing it. I started corcheting when I was a kid. It is soo relaxing. Very good information for kids, thank you. My son recently learned to crochet... I had tried to teach him, but he decided it was easier to sit in a corner and play with the hook and yarn until he figured it out on his own... with frequent peeks over my shoulder. He just completed his first hot pad. He has made several little boats and people. P.S. I got this link via e-mail, through a yahoo group! I've never seen finger knitting before. I can't wait to try it with my kids! Thanks for the informative hub. 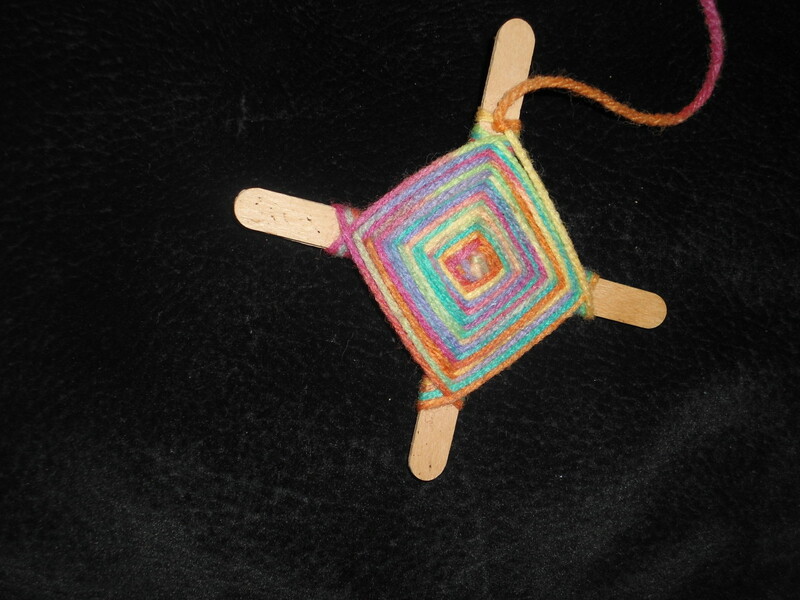 I love the idea of having the kids knit toys--something they can enjoy and be proud of. Of course I'm sure my kids will need to start with a simple scarf or pot holder! 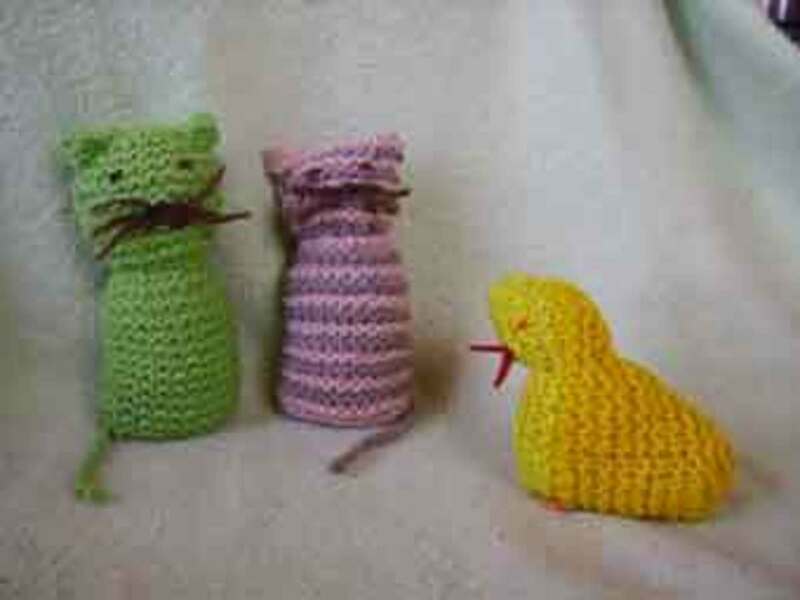 I think, es terrific to learn to crochet to childs. I have one at 5 and know with your help and tips are goning to start. I live in south america, so in winter, today became winter&acute;s holiday, so it&acute;ts a very good idea. Thanks, I am very happy to listening you by internet. Good for fine motor skill development. im 13 and im trying to learn to knit but i just cant figure it out if i watch a video it goes too fast or they block the view but if i just look at pictures i cant see how its done i can olny see how its supposed to look. I think i got the caxsting on part but im not sure. it looks firght but im not sure if im supposed to slide the loops over to the rigt needle or how to make the row i really need help! Big hooks and big yarn really helps. I agree that you should go for a smaller project at first. Let us know how it goes. I appreciate your response. The children I am working with range from 3rd to fifth grade. I did start them with finger crotchet &amp; they loved it. They were not responding well to graduating to chain with the needle. Their difficulty now is holding the yarn correctly. We end up with very spriling chains some very loose some very tight. Have devised a method of spending at least 10 mi with each child while my helper answers the calls of those &quot;I need help&quot;. It is slow and it is progressing slowly. The class is 45 mi twice a week and I have six weeks for the first group and seven for the second group. I had plans of finishing an afghan out of small squares but i am thinking maybe i should aspire for smaller accomplishments. Would appreciate any feedback from teachers and/or crotchet lovers. Kali, how old are the children? It is probably a good idea to teach them finger knitting first. Then you can slowly move up to implementing tools. I am in the process of teaching 11 children to crotchet. I am finding it difficult because i have only one helper and the need for one to one is very demanding. I would appreciate any comments or experience from anyone who has taught children how to crotchet.